Bright jewel colors in the dead of winter are nothing short of magical and Chef Ryan's Winter Fruit Salad with Honeycomb is a case in point. 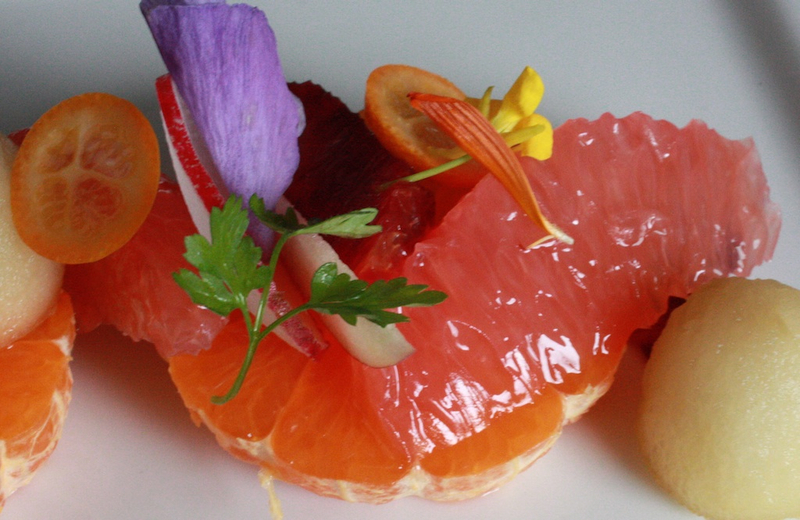 Check it out: Navel Oranges, Blood Oranges, Page Mandarins, Ruby Red Grapefruit, Fuji Green Apple, chervil, chive, edible pansies, rapini, radish, & last but not least, slivered kumquats from Chef's own backyard tree. Interesting combinations result as the taste buds pick out fruity, floral and fresh green notes in the dish. The dish also celebrates Chef's deft hand with Gastriques ~ sweet or savory reductions which are the result of sugar, often combined with fruit, caramelized until nutty brown, then cut with either vinegar or wine. Despite their reliance on sugar as a catalyst, gastriques are often savory for as sugar cooks, its sweetness subsides. Most bistro dishes are a result of the classic line up: Marbled cuts of meat using salt and herbs to heighten flavor, wine to mellow, starch to carry the sauce. But the ultimate brightness in many of Ryan's classic French country dishes comes from his love and use of vinegar. Two gastriques here rely upon vinegar ~ the mandarin and the apple ~ to bring a brighter nose and sharper initial taste before they mellow on the palette. 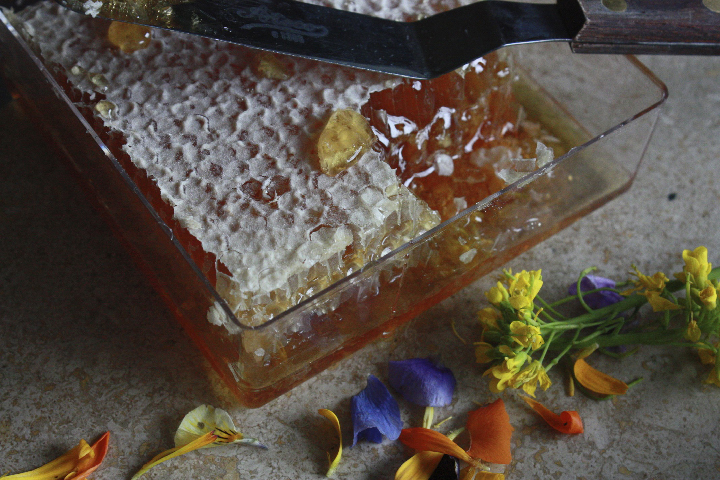 When we can, we serve honeycomb with our artisan cheese plates to remind folks honey doesn't start out refined in a jar. 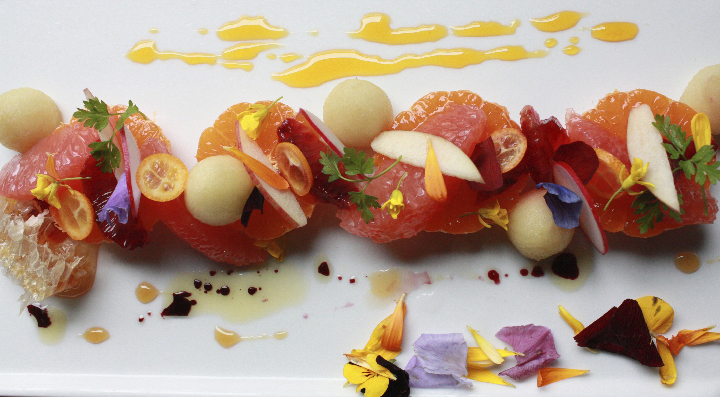 The honeycomb served with this fruit salad comes from Hector's here in Sonoma County. 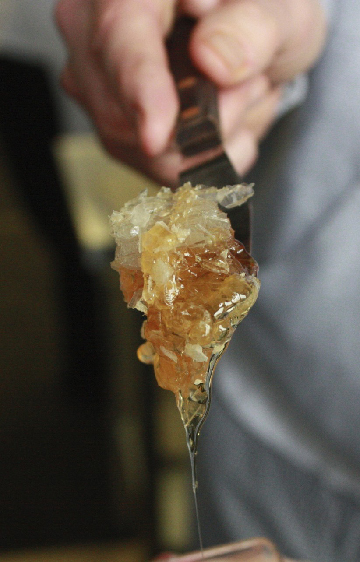 Bees have been much on our mind as of late, as the mysterious 4 year-old crisis of disappearing honeybees deepens. While a new heavy bee die-off this winter may be the result of extreme weather, no one really knows yet what's causing a worldwide hive collapse. Pesticides surely play a role, but sometimes I think ~ between CAFOs and suburbs ~ bees have just had enough. Say it isn't so. all photos and text, Jil Hales, unless noted otherwise.